So much media attention these days is given to mixed martial arts. And while the men and women competing are very skilled fighters, the goal of MMA and traditional martial arts can be very different. The aim of traditional martial arts is not to beat another human being into submission. A good program actually can make students less aggressive. It teaches physical and mental discipline, along with respect for others and yourself. And as you get older, it can take longer to heal. So, youth is a prerequisite for MMA. However, age should not be a deterrent for Aikido and some other arts. In Aikido, you’ll often find a wide age range. Students learn in a cooperative atmosphere where they improve their techniques and the mental aspects that actually make those techniques flow. I’ve had 50 year old men come into the dojo. Many feel fragile at turning 50, as they reminisce about the days when they did full contact karate. I ask them if they want to do full contact karate now and they immediately say no. But they’re under the mistaken impression that just because they’re not in their 20s or 30s that they can’t learn something new. That’s sad. 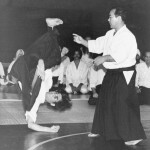 Aikido is not based on strength and speed as they know them. And it’s a challenge in the beginning for them to relax as they move. That muscle tension often comes from the mind. It’s counter intuitive for them. Take elite athletes. They’re not tense as they perform. Yet, they appear powerful and fast. But consider their movement is more of relaxation and flow, backed by mental confidence and a good understanding of what can be accomplished when the mind and body are in harmony. That in part is Aikido. Oh, and it’s fun. Hope you’ll stop by for a visit. Joe DeCapua, Lead Instructor, South Mountain Aikido. Welcome to the mat of infinite possibilities. Enter with an open mind, joy and respect. Learn. And help others learn. Leave your ego at the door. It will await your return. Expect great things from yourself and others. We’re Celebrating Our 15th Anniversary in 2019!! !